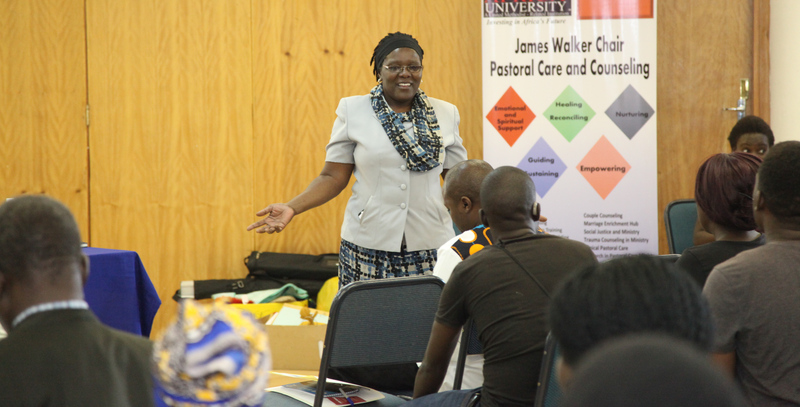 Led by the James Walker Chair of Pastoral Care and Counselling Dr. Mazvita Machinga, a workshop was held for people living with disabilities in the Manicaland Region under the theme, “My ability is stronger than my disability”. The workshop was graced by the presence of members of Tariro Foundation Trust, the Zimbabwe Ministry of Sport and Recreation, Diamond FM and representatives from the Jairos Jiri Rehabilitation Centre. The purpose of the workshop was to create an interactive platform where a space is created that encourages open dialogue on the identification and the understanding of the needs, concerns, challenges and coping strategies of people living with disabilities in contemporary Zimbabwe and honestly analyses whether any gains have been made in safeguarding the dignity and integrity of those living with disability while applauding the milestones reached and identifying areas where similar strides can be made. “The purpose behind this provocative title is to reframe the way the community looks at those with disabilities and how those who are disabled look at themselves. Yes, you may face challenges be it with mobility, sight or speech but what you are able to do far outweighs these impediments that some of you may have been born with or developed over time”. Based on the values of Ubuntu, Dr Pedzisai Mangezvo, the head of department for Social Work in the College of Social Sciences, Theology, Humanities and Education, emphasised the need for society to change its perspective towards the stigma and discrimination that people living with disabilities face. He also highlighted that the community needs to accept differences and to acknowledge the various capabilities inherent within each individual. Reinforcing the theme of ability over disability, the workshop was also an avenue for the uplifting and motivation of those living with disability through the showcasing of beautiful art and crafts made by some of the entrepreneurs and social innovators who were in attendance. These included bags, scarves and an array of high fashion accessories. A presentation by Sister Joyce who is physically challenged from the Jairos Jiri Rehabilitation Centre highlighted the challenges faced by people living with disabilities. These challenges include a high cost of living that is triggered by various physical conditions that require specialist consultations, the purchase of expensive crèmes and ointments as well as various prosthetics. Discrimination in public spaces, employment spheres and domestic settings were also highlighted as plights that pose a constant challenge.